There is no other way to say it: Magnoli manufactures high quality fit to order suits. 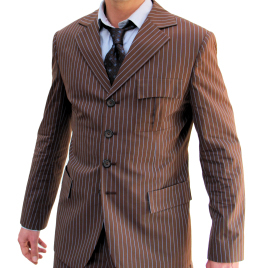 Once, not so long ago, I ordered what I thought to be a fair quality replica of a brown Tennant style suit from an online vendor with a storefront on Amazon. While the suit was also fit to order, the quality component easily visible in Magnoli garments just wasn't there. I am happy to say that I am now the proud owner of both a brown and blue suit. They are comfortable, fit me to a tee, and are not costume pieces, but rather high quality garments worth the asking price. For the more than casual fan looking to Cosplay, or for someone who wants to slip into the workplace in a stylish (yet vaguely familiar only to some) suit, Magnoli is the key.